On Wednesday over lunch I decided to walk east, a direction I almost never go, and for good reason — there’s pretty much nothing there. Once you get past city hall, the federal courthouse, and all the government buildings, you’ve got little else besides a highway, a few old churches, the Greyhound Station, and a bunch of industrial lots and increasingly bedraggled pedestrians. On the eastern edge of downtown, though, at 9th and McGee, is one of the city’s most interesting buildings, the former Pickwick Hotel and Union Bus Depot. The building is in pretty decent shape, except the clock has been stuck at 4:25 for as long as I can remember, reminiscent of Walter Benjamin’s descriptions of time coming to a stop, a critical moment for the historical materialist “in which he himself is writing history.” My friend Nathan does a great job of describing Benjamin’s notions of history in his meticulously researched and thematically soundtracked podcast. In fact, it was Nathan who first told me about this unique Kansas City landmark, which I’m sure factored into his own writing and understanding of time, philosophy and the city. 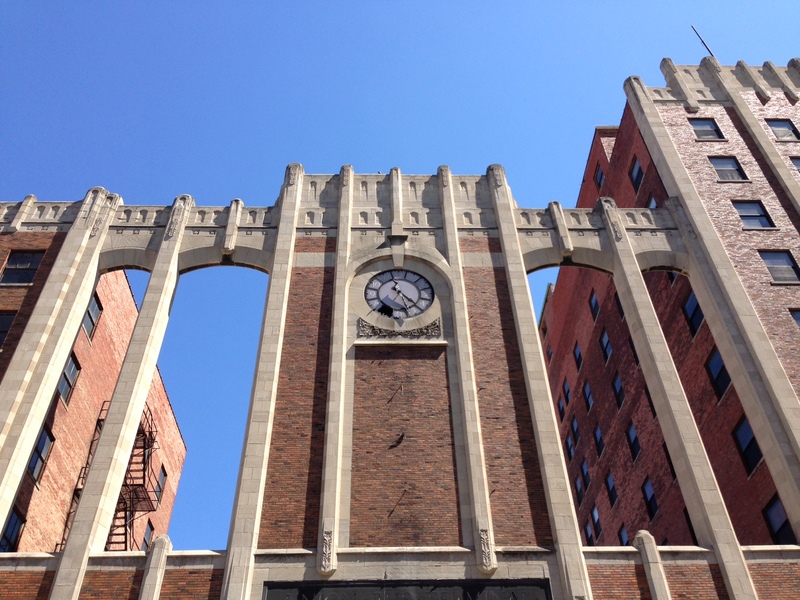 All I could think of while watching birds fly in and out of the broken clock face where the 7 used to be, is how surreal and gothic the former Pickwick Hotel looked even at noon on a bright summer weekday. With all plans to renovate it cast aside and no visible designation as a historical monument, the frozen clock tower stands as an intermediary between the commerce and bustle of downtown and the mostly vacant stage set of its eastern hinterlands. Its stately yet suspended-in-time presence manages to effortlessly embody a future that awaits its surroundings, and which awaits us all.